Some days call for getting dressed, whilst others call for merely scraping the nearest items off the floor and throwing them on. Recently I’ve been going through weeks where I’ll just be working away, and wearing something pretty is on the bottom of the priority ladder. Naturally I thought I’d photograph an outfit to give as an example, just in case you’ve ever wondered what that looks like. Some days I don’t even make it to getting jeans on – bunny pyjamas or jogging bottoms will do, but when a food run (or in this case a Zara run) is on the cards, that’s where blue jeans come in to play. I’d always said – don’t buy ripped jeans, just buy normal jeans and rip them yourself. I’m now eating my words as I picked up these ripped Topshop leigh jeans a few months back as I was just obsessed with the colour. I’ve got a lot of wear out of them, which is surprising as I’m not the biggest blue jean fan (nothing makes me feel more pulled together than black skinnies), but same goes for the Birkenstocks. Seriously, what is happening to me? Making a mental note to myself to make more of an effort getting dressed next week. 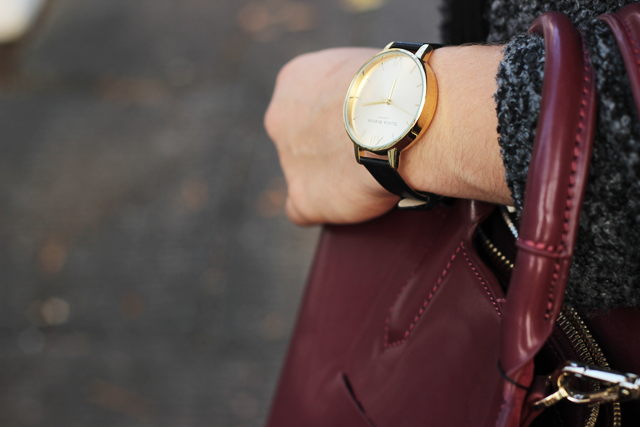 Great look, love the pop of burgundy! I totally understand why you were obsessed with the colour! These have so much more intrigue to them than a regular pair, I love the semi-acid-washed-kind-of? look to them. As always, you look stunning Suzie and this honestly does not look like a thrown together outfit at all so you're doing something very, very right. I always buy blue jeans then chicken out of wearing them and resort back to trusty black or white. These look fab on you! I actually love this outfit! Maybe it's because I love it when it's comfy and simple! Love those jeans! I agree, I usually just rip my own jeans too! This outfit is lovely Suzie! The colour of those jeans is absolutely gorgeous! I might have to pick up a pair myself, in love with them now! I love the outfit! Especially the bag! I love the colour of those jeans – no wonder you were sold! I love your outfit! The color of the bag is very pretty! That coat and bag is so gorgeous and very autumnal! You look gorgeous! I love posts like these; they get me so excited for autumn! I like this look! I am guilty of buying ripped jeans all of the time… they're just too pretty to resist! love how you've styled this outfit, always find i hard to style blue jeans!! I actually love this outfit. It looks comfy & cute. 🙂 Love those jeans! Love this outfit, I especially like the pop of colour with the burgundy bag. Great post. I'm all about the ripped jeans at the moment! A pang of sadness as I admire your Birks… I can't find them in stock in my size ANYWHERE! good As I previously talked about above, the Laptop or computer variant thanks to snaptubedownloadapps When you open the app, you can type in any video file you wish to see or download. SnapTube Download Android nice. good to get applied on almost all of the android os based mostly equipment. guide from itubedownloadapps You perform not really have got a great deal of applications iTube iOS Download nice. good Android, Iphones. This application will transformed the method Showbox APK the Showbox could conveniently become your favorite nice.